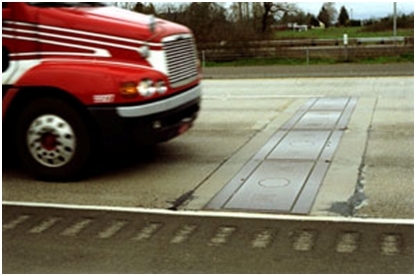 ﻿WIM scales are instrumented plates mounted in a rigid frame fixed in the pavement structure, which measure the wheel/tire vertical forces of the running vehicles. 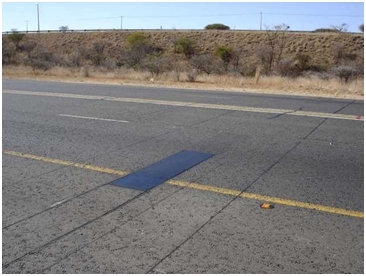 The scale length in the traffic direction is more than a wheel/tire imprint (≈ 0.30 m), but less than the minimum axle spacing (0.80 m). The scale width is either below 1 m (wheel scale) or above 3 m (axle scale). Therefore it measures either the wheel or axle impact force at once. Load cell: the plate is rigid and a series of load cells are mounted between it and the support frame, to measure the vertical forces transferred from the wheel/axle to the plate and then to the frame. The load cells are calibrated in factory and certified by the legal metrology. This is an accurate but expensive technology, mainly used for low speed (LS-)WIM, but also in some cases for high speed (HS-)WIM, mainly for enforcement purposes. The measurement is independent on the load location on the plate. Bending plates: the plate is simply supported by the frame at its edges, and instrumented with stain gauges, which measure the plate bend while a wheel or axle is crossing it. The bending strains are proportional to the vertical force if applied at the same location. Combining several strain gauges, the wheel transverse location may be estimated and the measured vertical force becomes almost independent on it. However, this technology is both cheaper but less accurate than the load cell. It is mainly used for HS-WIM. The other WIM sensors which extend all along the tire imprint are mats, installed on the pavement surface. Capacitive mats measure the capacitance change under the tire force pressure.